To say Apple&apos;s been on one lately is a bit of an understatement. The company has been experiencing record quarters and has sold millions of iPads, iPhones, and iPods (410 million devices in 2011). It is now the world&apos;s most valuable company. 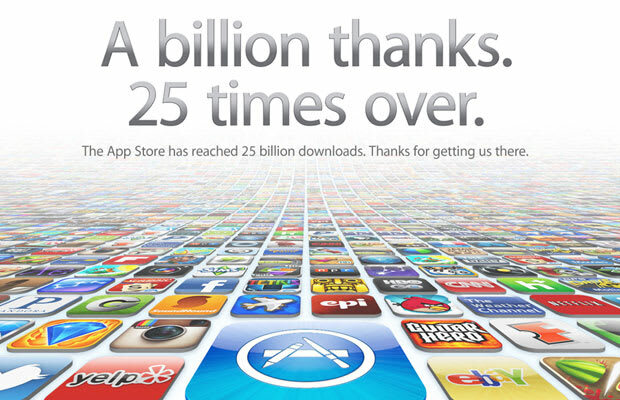 Today, the Cupertino, Calif.-based corporation boasted of another milestone: its App Store has reached 25 billion downloads. Head over to Apple.com now and you&apos;ll see the banner we&apos;ve posted above. Considering the Apple App Store is home to around 600,000 apps, that number is staggering. According to AppleInsider, Apple has paid app developers over $4 billion. Apple&apos;s App Store is the most robust app store available to any mobile customer. With such a robust and large, growing number of apps, it&apos;s not hard to see why the company continues to sell millions of iOS devices.